You may have heard about the CTM, Cleansing, Toning and moiturisation. But that is for the face right. But what about the body skin. After taking shower or cleansing, you must go ahead and get the proper moisturization. It is the basic step in every skin care regimen. Even for the hair moisturization is required. This is why body lotions, body butter and creams have come into existence. 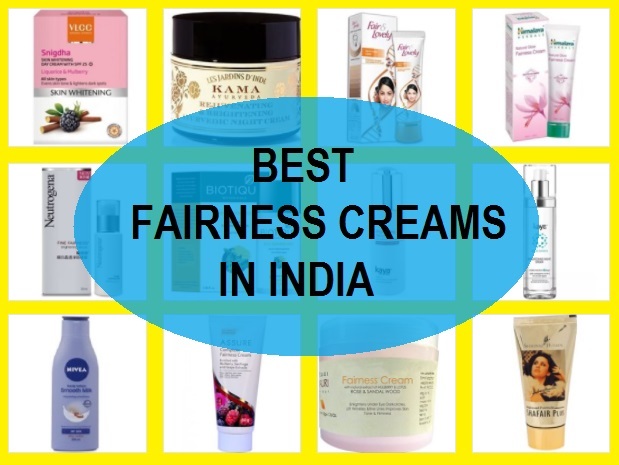 The body moisturizing products are of variety for formula, but here we are going to talk about this list of the best body lotions in Indian market. They are quite essential hence skipping them regularly is not right. Your body skin too needs that hydration to stay youthful and alive. A lot of body lotions even have the SPF thus, they not just give you hydration but also gives UV rays and sun protection. For getting a healthy skin, use of the body moisturizers is must. 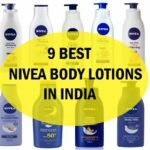 Let’s take a look at the best body lotions in India. Out of the variety of body lotions, we segregated the list into best body lotion with SPF, for skin whitening and for the regular usage. 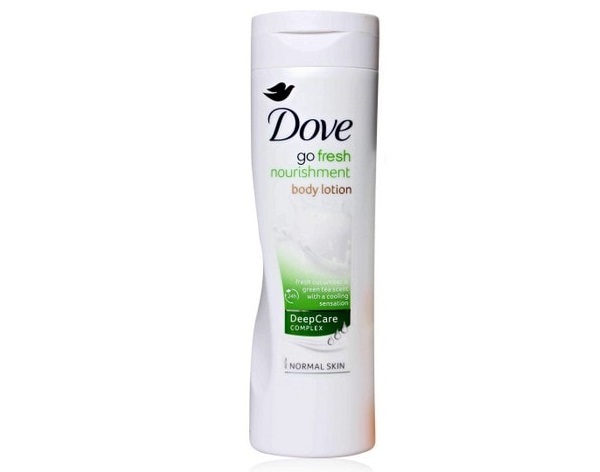 Dove GO Fresh lotion is a light in formula and non greasy body lotions that one can try during summer season. Its light formula is good for oily skin and for the normal skin as well. During summers when the skin already sweats we do not need a lotions that can make these skin sweaty or greasy. 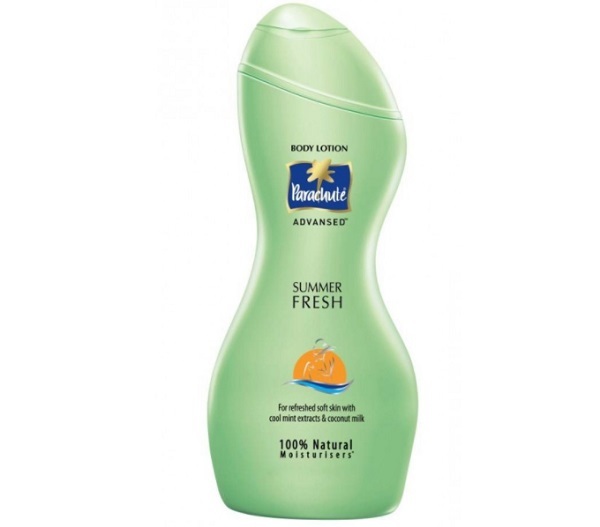 Therefore, this can be your most used body lotion for summers. It is rich in the cooling cucumber extracts along with the rich in anti-oxidants Green Tea. It provides mild cooling sensation and is appropriate for men as well. 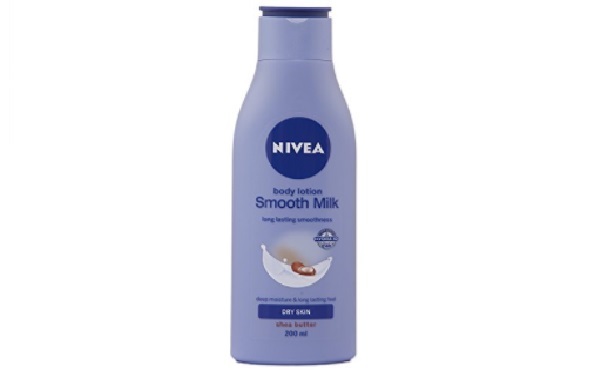 Nivea Smooth Milk Lotion is good for all skin types and even the dry skin during summer time. It is rich in the skin moisturizing emollients. This body lotion has the vitamin E and the she butter that can give you smooth and glowing skin. It is also an ideal lotion that can be used by men and women in India. The tall bottle with a flip top cap is safe to be carried while you travel. The is our best body lotion for dry skin. Plum products are gaining popularity due to their organic nature and paraben free products. The too is the best paraben free body lotion that is rich in the wild cherries and kiwi Extracts. This also boosts the skin with not just the moisturization but the Vitamin C of Kiwis and fruit enzymes. It has elements like the Sunflower Seed oil, Glycerin and Shea Butter. It comes in a beautiful pump dispenser but on the downside you cannot take the pump along with you once it is opened. Dry skin needs extra hydration and hence, this section is for the people who have got dry and very scaly kind of skin that require more moisture even in the summers, let alone the winters. 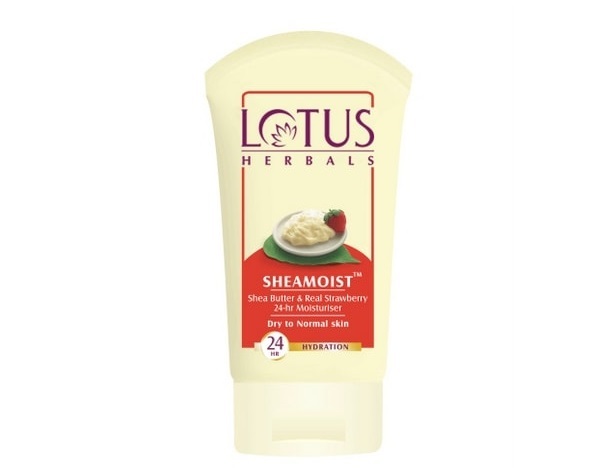 Lotus Herbals Sheamoist 24-Hour Moisturizer is not like a regular moisturizer for your body, but it is one for the best body lotion for very dry skin with SPF. As the name suggests, it has Shea Butter. 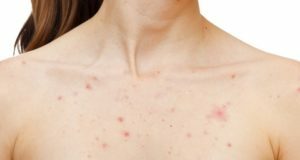 It spreads easily on the skin and its availability is also very easy. 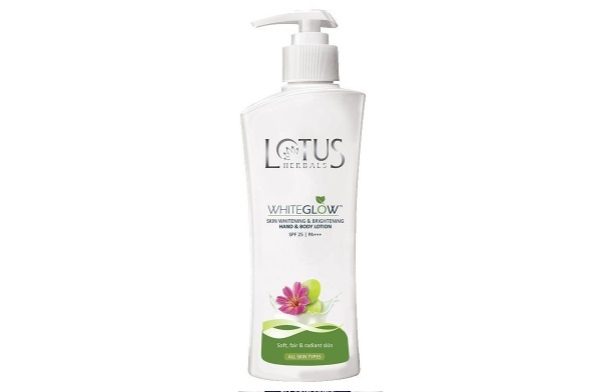 Lotus products are very good and quickly available in Indian market. It is enriched with Shea butter & real strawberries. 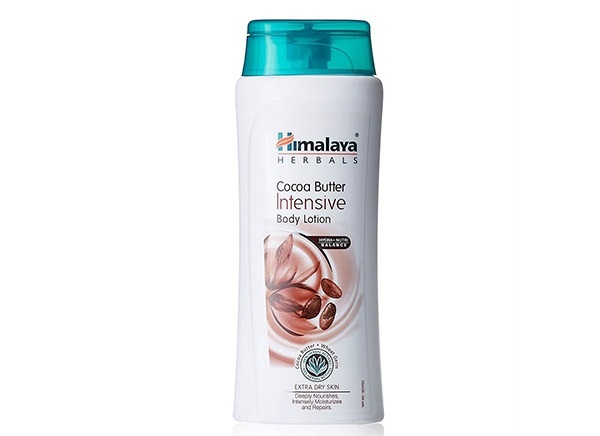 Cocoa butter is known to cure the dry skin like no one product can, this is why this Himalaya’s Cocoa Butter Intensive Body Lotion is a must have for harsh winters for dry skin. It smells nice and gives that subtle whiff of cocoa all through the day. By far, it is the best body lotion for dry skin, is suitable for everyday use for men and women. It restores the moisture and makes your skin feel velvety smooth. Along with cocoa butter, this is also packed with wheat germ to improve the skin texture. 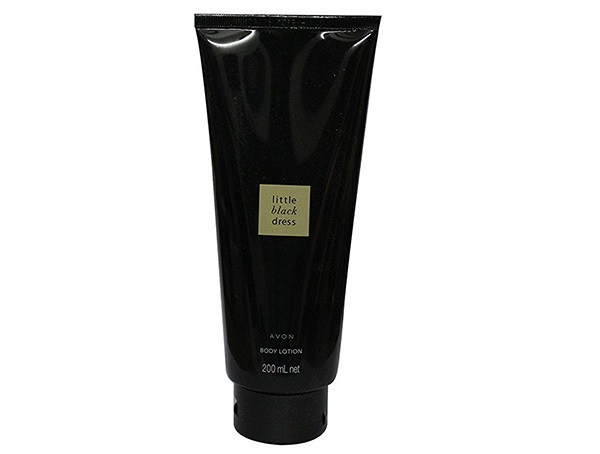 Avon Little Black Dress Body Lotion is one of the best smelling body lotions that can be applied in all seasons. It has the same wonderful smell, just like the Avon Little Black Dress. It is light weight and gives that reviving feel while you are applying this. It is beat smelling body lotion. 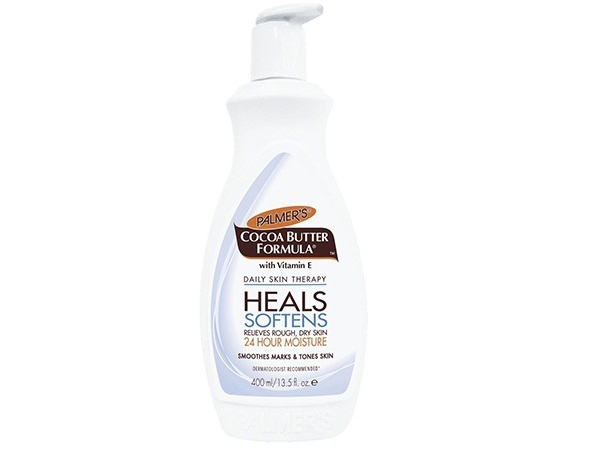 Another cocoa butter body lotion is from Palmer’s. Palmer’s products are very high quality and very effective. Price too is very affordable. It can also give you improvement in the skin’s texture. A body lotion as thick and effective like this can defiantly heal your winter dryness. Palmer’s body lotion is made using the rich vitamin E content. It can treat the dry skin and scaly patches on the face. VLCC Almond Honey Body Lotion that is vitamin E rich and also has the almond extracts. It heals and cures the skin and is effective in the dry skin treatment. It is good for the mature females as well to give them the smoothening effects. It also aids as best anti aging body lotion. The winter body lotion is meant for the rough and dry skin in winter. 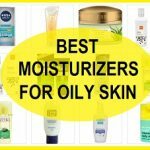 It is adequate to give you moisture and skin healing. Cherries are rich in natural anti-oxidants that can ease the skin dryness and also protects the skin from the harmful UV rays. 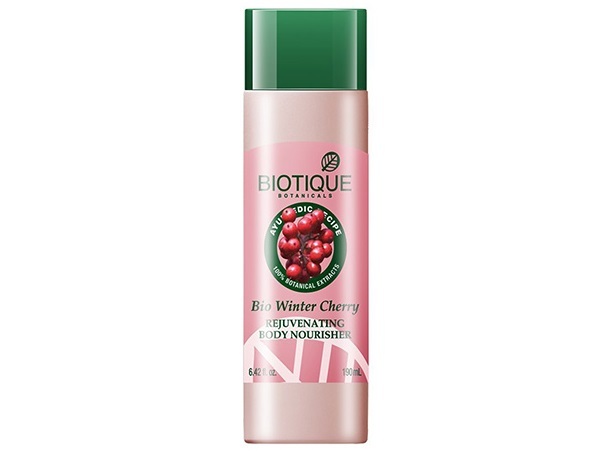 The Biotique body lotion is excellent for winters for all the family members. It has winter cherry, sunflower, safflower, musk root and almond oil that aids in the hydration of the dry rough skin. 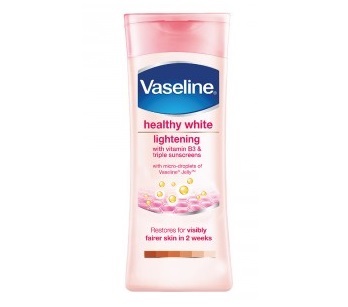 Vaseline Healthy White Triple Lightening Body Lotion is made using the Vitamin B3 and the goodness of the SPF 24 PA++. It is suitable for the oily to normal skin and for the combination skin as well. it increases the skin’s fairness and gives glow. The skin whitening body lotion blends nicely on the skin to reveal a fairer looking skin complexion. The best thing is that it is non greasy and non oily in texture. Rid if the Availability is also very easy since Vaseline products are there in every shop and online store in India. This is one of the best Body lotions for summers. 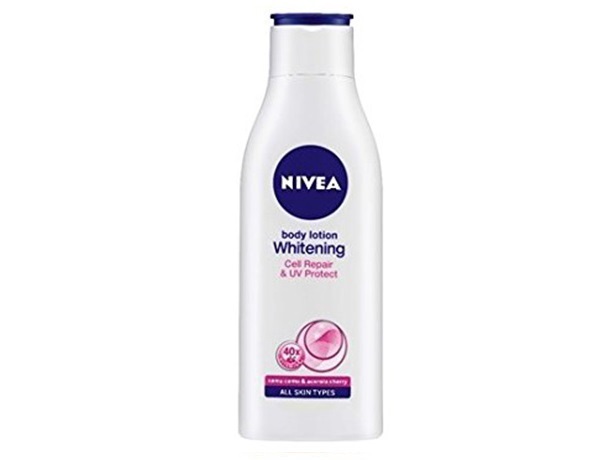 Nivea Cell Repair &UV protect body lotion is easy to blend on the skin and also makes the skin tone lighter. The lotion blends well on the skin and skin looks glowing. The product is non greasy and can be found in every super market’s shelf. You can apply this lotion few minutes before stepping out of the house. It has UV protection hence, can be used in summers as well. The richness of Vitamin C and Camu Camu helps in lightening the skin. Santoor is a brand that is known for their soaps. Their turmeric and chandan bathing soaps are really good and do not make the skin dry. 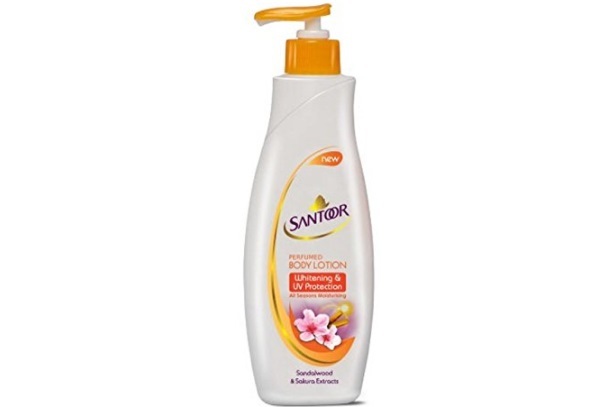 The skin whitening lotion from Santoor has the ingredients that can whiten your skin and also brighten the face. The lotion is also best body lotion for the skin that is sun burnt and tanned. It has the Japanese Sakura flower extracts for effective skin whitening and giving the natural anti-ageing properties. Apart from that it has the by default ingredient in it which is the sandalwood, that soothes the irritated akin and whites it. This section is for those who are thinking of using the lotions that are rich in the SPF so that you can apply them and get the benefits of the sunscreens. 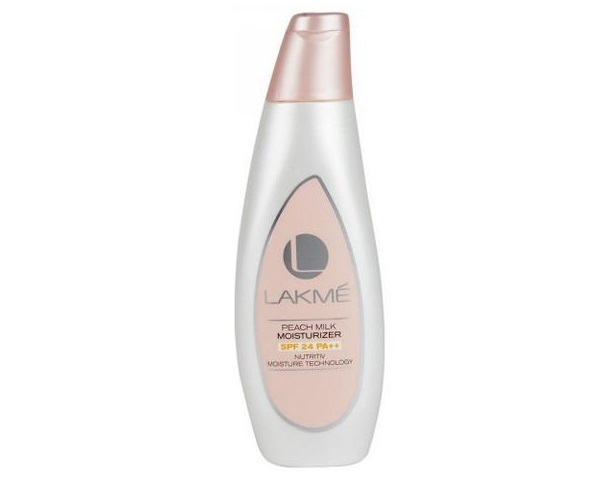 Lakme Peach Milk Moisturizer is one of the best body lotions from Lakme. It contains the skin healing emollients, anti-oxidants and vitamins that makes your skin not juts softer but hydrated and lighter as well. This body lotion as SPF 24 that is considered adequate for your day today usage. 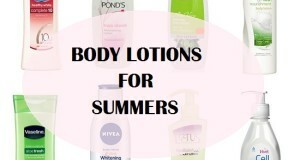 It can be your go to summer as well as winter lotion. 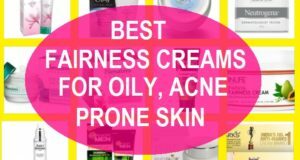 It is non greasy and gets inside the layer of the skin nicely. Moreover, it won’t leave any white residue. 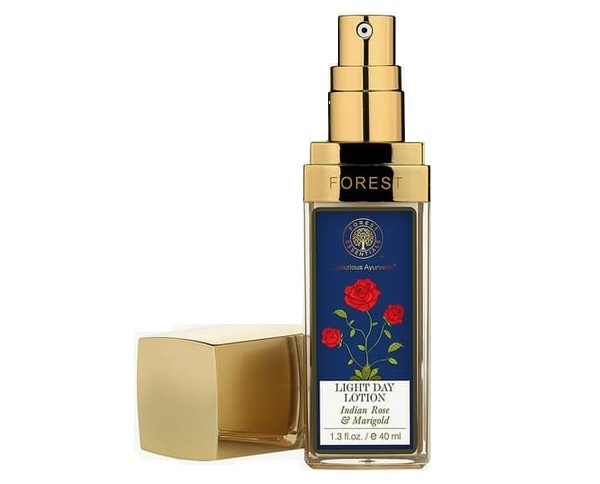 Forest Essentials Light lotion for the day has the Indian Rose & Marigold lotion. The pump dispenser is useful and can be used in the day time. It is suitable for the people with normal to dry skin in all around the season. 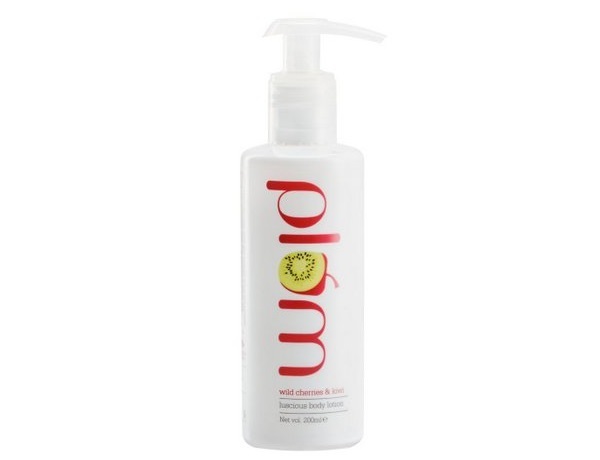 The lotion has the Ayurvedic herbs like Ashwagandha and Gokharu along with Almond, Wheat germ and Olive oils. The ingredient helps to give the skin benefits for these ingredients. It is powered with SPF 25. It is one of the best luxury body lotion in India. 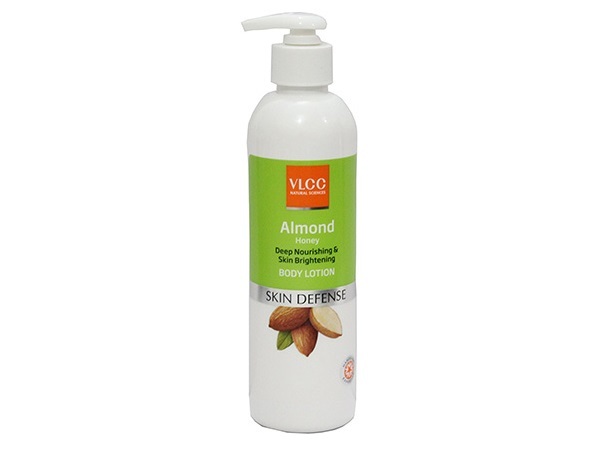 VLCC Almond Body Lotion as the name suggest is rich in the almond extracts. Almond are rich in the natural Vitamin E that is immensely beneficial for the cure of dry skin and aging skin. So, while you have dry skin then using an almond rich body lotion would be just perfect. Just apply this lotion once and it will treat the skin dryness. It also has SPF 15 in it. Therefore, even in the hot summers, the body lotion will take care of your skin by protecting it from the UV rays. 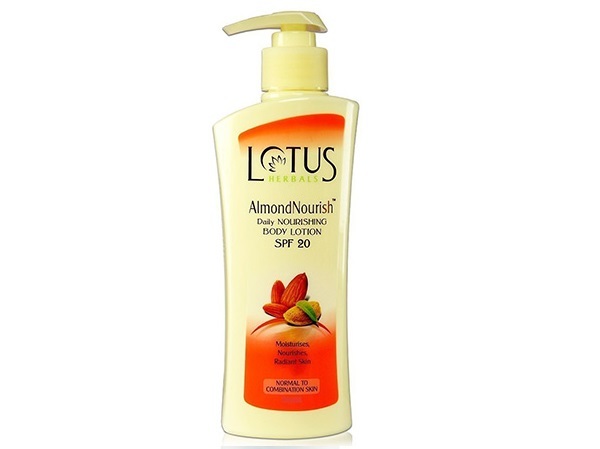 Lotus Herbals Almond Nourish Daily Nourishing Body Lotion is your sunscreen and body moisturizer that is rich in the organic ingredients like almonds. It has SPF 20 to give you sun protection. It applies well on the body and give proper masturbation. Ever wish to get the body lotion to get you fairness and wit SPF too. Yes, Lakme Sun Expert Fair Sunscreen Lotion does exactly that. It has fairness giving ingredients and also has SPF 24 in it. 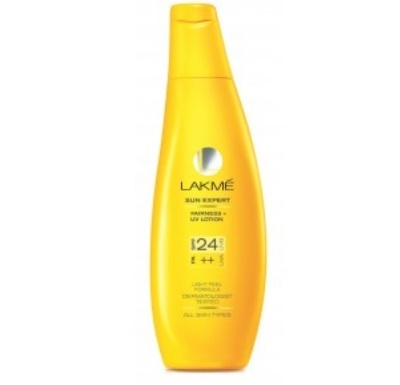 Lakme body lotion or sunscreen lotion has the lemon grass and other essential ingredients that can give you rich moisturization plus the skin whitening. It increases the skin’s tone and texture and also fades the dark spot spots. 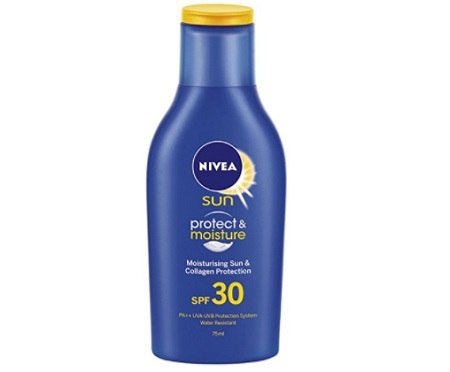 Nivea Sun Moisturizing Lotion has SPF 50 which is quite high. This is the best lotion for people with very dry skin and who needs high sun protection. It gives you protection from UV rays and has a broad spectrum protection. 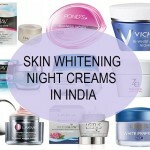 So, these are the best body lotions in Indian for skin whitening, with SPF and for the summers and winter season. They are with different price ranges and concerns. Have you used any of these? Which is your favorite one?